OBJECTIVES: This study was conducted to determine the number and types of oromucosal lesions (OMLs) in relation to tobacco habits in patients who attended the outpatient department. METHODOLOGY: A total of 1730 patients visiting the Department of Oral Medicine and Radiology were interviewed and screened for tobacco habits (smoking and smokeless). Clinical oral examination was conducted with diagnostic instruments using the Color Atlas of Common Oral Diseases as a guide for diagnosis. When clinical features were not diagnostic, a biopsy was done. RESULTS: Of the 1730 outpatients, 975 (56.3% ) individuals used tobacco in one or other forms and 687 (70.4%) of these had OMLs. CONCLUSION: The results of this study provide important information on the prevalence of OMLs in patients seeking dental care. This provides baseline data for future studies on the prevalence of oral lesions in the general population. Chewing and smoking of tobacco along with consumption of alcoholic beverages have become common social habits in India. Tobacco was introduced in India by the Portuguese nearly 400 years ago and since then it has become a part of the sociocultural milieu in various communities. India is the second largest producer and consumer of tobacco next to China. Tobacco contains a large number of carcinogens, with the most significant being polycyclic aromatic hydrocarbons, aromatic amines, and nitrosamine which cause cellular damage. The smoking forms of tobacco contain more than 4000 different chemicals and at least 50 are known carcinogens, whereas smokeless tobacco contains 28 carcinogens. Both smoking and smokeless tobacco produce a number of oromucosal lesions (OMLs) ranging from melanin pigmentation to potentially malignant disorders (PMDs). Patients with a combination of these above-mentioned habits are frequently found in India and are considered to be at a higher risk of developing oral lesions because of added and prolonged exposure to carcinogens. Hence, this study aims to assess the prevalence and types of various OMLs associated with the use of tobacco in western Maharashtra. This study was conducted among patients who were new and reported to the School of Dental Sciences, KIMSDU, Karad. The study was approved by the Ethical Committee of KIMSDU, Karad. Informed consent was obtained from all patients participating in the study. Along with patient's demographic details, information regarding the type of habits (smoke and smokeless), duration, frequency, site of placement, period of contact with mucosa, and history of discontinuation of habit were recorded using a standardized interviewer-based questionnaire. All patients were then clinically examined on a dental chair using diagnostic instruments under artificial illumination. The diagnoses of clinically suspicious lesions were confirmed by biopsy. Tobacco-related OMLs were diagnosed based on the clinical features using the Color Atlas More Details of Common Oral Diseases as a guide. All patients with history of tobacco consumption were made aware of the harmful effects of tobacco and were motivated to quit. Based on the form of tobacco used, the patients were divided into smokers, chewers, and mixed (smoking + chewing) categories. The collected data were tabulated, and frequency and distribution tables of OMLs were generated using Statistical Package for Social Sciences version 16 (SPSS Inc. Released 2007. SPSS for Windows, Version 16.0. Chicago, SPSS Inc.). Of the 1730 patients interviewed and examined, 975 (56.3%) had a habit of some form of tobacco consumption and 687 (70.4%) of these had OMLs. Of 975 tobacco users, 656 (67.28%) were males and 319 (32.71%) were females [Table 1]. In males, the most prevalent habit was smoking [305 (46.49%)], followed by chewing [220 (33.53%)] and mixed (i.e., both smoke and smokeless) tobacco consumption [131 (19.96%)]. All females were exclusively chewers. The most prevalent tobacco habit among our study population was chewing [539 (49.23%)]. The most commonly affected age group [Table 2] was 36–45 years followed by 46–55, 26–35, and >55 years. The number and severity of OMLs was directly proportional to the duration and frequency of tobacco use, although there were few exceptions. The prevalence of OMLs [Table 3] was highest among chewers. 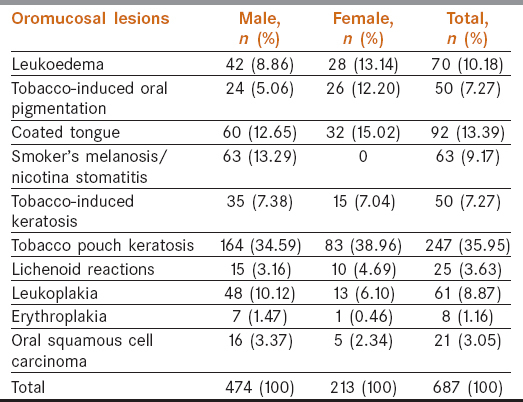 The prevalence of tobacco pouch keratosis (247, 35.95%) was highest, followed by coated tongue (92, 13.39%), leukoedema (70, 10.18%), nicotina stomatitis (63, 9.17%), leukoplakia (61, 8.27%), tobacco-induced pigmentation and keratosis (50, 7.27%), and tobacco-induced lichenoid reaction (25, 3.63%). Only a few patients had oral squamous cell carcinoma (OSCC) (21, 3.05%) and erythroplakia (8, 1.16%). Tobacco has become a global epidemic and its consumption is a global health problem. It is most commonly smoked in the form of cigarettes or bidis (a crude form of smoked tobacco). The Global Adult Tobacco Survey conducted by the International Institute of Population Sciences, Mumbai, India, on behalf of the Ministry of Health and Welfare in 2009–2010 reported that more than one-third of the adults in India use tobacco in some form. Approximately 29% of adults use tobacco on a daily basis, whereas little more than 5% are occasional users. The prevalence of tobacco use among males is 48% when compared with 20% among females. Smoking, drinking, and tobacco chewing have been positively associated with OMLs such as leukoplakia and erythroplakia, which have the potential for malignant transformation. All these habits have been established as risk factors for the development of PMDs of the oral mucosa.,, Long-term contact of tobacco with the oral mucosa induces a variety of changes which could be because of the carcinogen itself or as a protective mechanism of the oral cavity. Tobacco consumption is an important cause of both addiction and development of PMD and oral cancer. It also remains one of the most avoidable risk factors for the same. Tobacco-related cancers account for nearly 50% of all cancers in men and 25% in women. Tobacco-induced mucosal lesions that are less likely to cause cancer are leukoedema, smoker's palate, and tobacco-induced lichenoid reaction. Smokeless tobacco use is very common in India. Tobacco or tobacco-containing products are chewed or sucked as a quid, applied to gums, or inhaled. Tobacco pouch keratosis is a condition that results from spit tobacco being habitually placed in the mucobuccal fold in the mandibular anterior or posterior regions where the mucosa is in direct contact with snuff or chewing tobacco. The prevalence of tobacco pouch keratosis (30.95%) was highest in our study population followed by coated tongue (13.39%). The pathogenesis of leukoedema (observed in 10.18% of our study participants) is multifactorial; smoking and chewing are the predisposing factors of leukoedema. Smoker's melanosis/smoker's palate/or nicotina stomatitis (the prevalence was 9.17%) may be because of the effects of nicotine on melanocytes located along the basal cells of the lining epithelium of oral mucosa. Nicotine stimulates melanocytes to produce excess melanosomes, which results in basilar melanosis. It is usually seen in smokers characterized by whitish mucosa with a red central dot to high temperature rather than the chemical composition of the smoke. In our study, of the 975 patients who had a habit of tobacco consumption, 656 (67.28%) were males and 319 (32.71%) were females. The majority of the studies have not confirmed gender differences in prevalence of the lesions. The high prevalence of lesions in males could be attributed to the higher number examined and the higher prevalence of tobacco use by males and the greater access they have to the outlets that sell tobacco and its products, whereas because of cultural constraints women have to maintain a certain image and therefore are less likely to practice these unhealthy habits. The most prevalent tobacco habit among our study population was chewing followed by smoking and mixed tobacco consumption, and the most commonly affected age group was 36–45 years. Similar results were also found in other Indian studies with little variation in the occurrence of lesions. One study documented the association of higher level of chewers' mucosa and tobacco pouch keratosis among the tobacco chewers' group. Another Indian study reported leukoplakia (13.1%) and tobacco-induced keratosis (9.7%) in smokeless tobacco users. A study by Saraswathi et al. reported only 4.1% of oral soft tissue lesions in which smoker's melanosis (1.14%) was found to be the most common soft tissue lesion, followed by stomatitis nicotina (0.89%) and leukoplakia (0.59%) which was very less. Patil et al. documented high prevalence of leukoplakia among mixed tobacco consumption habit (i.e. smoking and chewing). Mathew et al. reported a high prevalence of smoker's palate (2.77%), followed by oral submucous fibrosis (2.01%), leukoplakia (1.59%), betel chewers' mucosa (0.84%), and oral malignancies (1.76); they also stated that mucosal lesions such as tobacco-related lesions (leukoplakia, smoker's palate, and oral malignancies) were more prevalent among men than among women. Another study documented the prevalence of OMLs in smokers and chewers and concluded that smoker's melanosis (58.2%) was the most frequently encountered lesions in smokers and pan-chewer's lesion (21.8%) and tobacco pouch keratosis (16.4%) in chewers. Leukoplakia (22.5%) was the most common lesion followed by OSCC (12.5%) in the mixed group. Sinha et al. in their study (of prevalence of smokeless tobacco use among adults in WHO South-East Asia) stated that, the use of smokeless tobacco was found to be higher among males as compared to females in India, Myanmar, Nepal, and Sri Lanka. However, in Bangladesh, Indonesia, and Thailand, Smokeless tobacco use was higher among females as compared to males. In one of the case–control studies, Sahitha observed that the most common lesions were coated tongue (100%), followed by gingivitis (57.3%), oral melanosis (46.5%), periodontitis (42.6%), SCC (1.1%), and leukoplakia (2.7%) in smokers and only halitosis and dental stains in nonsmokers. Al-Attas et al. reported high prevalence of OMLs (88.8%), with hairy tongue contributing 50%, smoker's melanosis 36%, stomatitis nicotina 28.9%, frictional keratosis 27%, leukoedema 20%, and leukoplakia 2.3%. All these study results were in accordance with this study with little variation in occurrence of lesions. These variations could be attributed to the cultural variation in the Indian subcontinent and the availability of tobacco products in those particular regions. The result of this study provides information on the association of OMLs in smokers, chewers, and patients with mixed habits. The most prevalent tobacco habit among our study population was chewing. OMLs were more prevalent in males compared with females, and the most commonly affected age group was 36–45 years. Male predominance could be because of the prevalence of deleterious oral habits in males compared with females. Many of the lesions are asymptomatic or only mildly symptomatic; many a times these go unnoticed till they reach advanced stages, and the relative lack of awareness about the harmful effects of tobacco is a major reason for not approaching any physician/dentist. Prevention is the key to better oral health. To determine the overall incidence and prevalence rates, attempts should be made to accumulate epidemiological data over a wide geographical area that may help in formulating appropriate prevention and control measures. Health professionals, including dentists, should also play an active role in prevention and control of tobacco-induced lesions because of direct contact with patients who are at increased risk. Sridharan G. Epidemiology, control and prevention of tobacco induced oral mucosal lesions in India. Indian J Cancer 2014;51:80-5. Kaur J, Jain DC. Tobacco control policies in India: Implementation and challenges. Indian J Public Health 2011;55:220-7. Ahmadi-Motamayel F, Falsafi P, Hayati Z, Rezaei F, Poorolajal J. Prevalence of oral mucosal lesions in male smokers and nonsmokers. Chonnam Med J 2013;49:65-8. Chandra P, Govindraju P. Prevalence of oral mucosal lesions among tobacco users. Oral Health Prev Dent 2012;10:149-53. Sujatha D, Hebbar PB, Pai A. Prevalence and correlation of oral lesions among tobacco smokers, tobacco chewers, areca nut and alcohol users. Asian Pac J Cancer Prev 2012;13:1633-7. Langlais RP, Miller CS, Nield-Getrig JS. Textbook of Color Atlas of Common Oral Diseases. 4th ed. Philadelphia, United States: Lippincott, Williams and Wilkins; 2009. Aruna DS, Prasad KV, Shavi GR, Ariga J, Rajesh G, Krishna M. Retrospective study on risk habits among oral cancer patients in Karnataka Cancer Therapy and Research Institute, Hubli, India. Asian Pac J Cancer Prev 2011;12:1561-6. Government of India, Ministry of Health and Family Welfare, Global Adult Tobacco Survey India; 2010. Available from: http://www.searo.who.int/tobacco/documents/2010-pub2. [Last accessed on 2017 May 9]. Saraswathi TR, Ranganathan K, Shanmugam S, Sowmya R, Narasimhan PD, Gunaseelan R. Prevalence of oral lesions in relation to habits: Cross-sectional study in South India. Indian J Dent Res 2006;17:121-5. Yen AM, Chen SC, Chen TH. Dose-response relationships of oral habits associated with the risk of oral pre-malignant lesions among men who chew betel quid. Oral Oncol 2007;43:634-8. Javed F, Chotai M, Mehmood A, Almas K. Oral mucosal disorders associated with habitual gutka usage: A review. Oral Surg Oral Med Oral Pathol Oral Radiol Endod 2010;109:857-64. Sahitha R. Effects of smokeless tobacco, betel quid and areca nut on oral mucosa. IOSR J Dent Med Sci 2014;13:8-11. Reddy KS, Gupta PC. Economic History of tobacco production: From colonial origins to contemporary trends. In: Report on tobacco control in India. Joint report supported by Ministry of Health and family welfare, Government of India, Centre of disease control and prevention, USA: World Health Organization; 2004. p. 19-32. Al-Attas SA, Ibrahim SS, Amer HA, Darwish Zel S, Hassan MH. Prevalence of potentially malignant oral mucosal lesions among tobacco users in Jeddah, Saudi Arabia. Asian Pac J Cancer Prev 2014;15:757-62. Mehrotra R, Pandya S, Chaudhary AK, Kumar M, Singh M. Prevalence of oral pre-malignant and malignant lesions at a tertiary level hospital in Allahabad, India. Asian Pac J Cancer Prev 2008;9:263-5. Ferlay J, Pisani P, Parkin DM. Globocon. Cancer incidence, mortality and prevalence worldwide. IARC cancer base (2002 estimates). Lyon: IARC press; 2004. Kumar S. Oral submucous fibrosis: A demographic study. J Indian Acad Oral Med Radiol 2016;28:124-8. Patil S, Yadav N, Patil P, Kaswan S. Prevalence and the relationship of oral mucosal lesions in tobacco users and denture wearers in the North Indian population. J Family Community Med 2013;20:187-91. Mathew AL, Pai KM, Sholapurkar AA, Vengal M. The prevalence of oral mucosal lesions in patients visiting a dental school in Southern India. Indian J Dent Res 2008;19:99-103. Behura SS, Masthan MK, Narayanasamy AB. Oral mucosal lesions associated with smokers and chewers – A case-control study in Chennai population. J Clin Diagn Res 2015;9:ZC17-22. Sinha DN, Gupta PC, Ray C, Singh PK. Prevalence of smokeless tobacco use among adults in WHO South-East Asia. Indian J Cancer 2012;49:342-6.